Everyone was all dress up and excited to find out what the Colgate was about to launch. After an hour the seats were filled by prestigious guests, dentists and media all eager to know more. We were teased by Mr. Caro on Colgate's greatest breakthrough yet. Dr. Eric Tayag whom I've dance with before shows support toward the dental industry. A brief talk on dentistry for public service and flouride toothpaste as a solution. 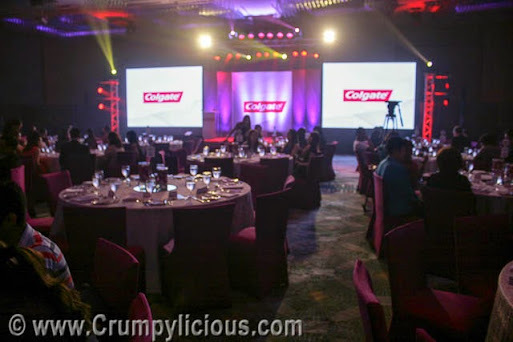 Philippine Association of Dental Colleges (PADC) and Colgate has a strong partnership through the years. We were served some blueberry cheesecake and vegetables in garlic dressing for appetizers. Many were on a diet and skipped the blueberry cheesecake. I swiped my plate clean. I already knew that sweet are not the only culprit for cavities. All the food we eat have sugar acids. Many were surprised with that fact and I bet they wished they ate their blueberry cheesecakes! All the fuzz is for the introduction of Colgate Maximum Cavity Protection with Sugar Acid Neutralizer Toothpaste! Now, our teeth can be better protected with the unique combination of flouride and the sugar acid neutralizer. You can actually test your own mouth with a PH paper to see the neutralizing effect. It's really astounding! Now, we can eat whatever we want and stay cavity-free. The package ironically comes with a pack of m&m's which I gleefully enjoyed. =) I brushed my teeth after of course! To celebrate National Pasta Day (October 25, 2014), Doña Elena invited us to learn more about it. So allow me to be a pasta geek and share with you what I learned during the crash course lecture. 1. Pasta are made using either teflon dies or bronze dies. Bronze dies produce coarser pasta which allows it to marry into sauces better. 2. The word "pasta" is derived from "paste." 3. "Al Dente" means "firm to bite." 4. To enable you to have "Al Dente Pasta", you have to combine cooking precision and the use of pasta made from 100% durom wheat semolina which are harder than normal wheat flour. 5. Don’t use oil when boiling your pasta. 6. Your senses should be keen when cooking. It should smell right and the color is still yellow when you blanch them. Chef David Lombardi demonstrated to us two delicious pasta dishes using Doña Elena products: Doña Elena Al Dente Penne Rigate, Doña Elena Al Dente Fusilli, Doña Elena Pure and Extre Virgin Olive Oil . Chef Lombardi is the owner of Lombardi’s and Lucia Ristorante (named after his mother) I’m glad Chef Lombardi shared his cooking technique with us because we’ve been using Doña Elena Pure and Extra Virgin Oil at home but we really don’t know the difference. Chef Lombardi taught us to use the Doña Elena Pure for cooking and the Doña Elena Extra Virgin for last minute flavoring. I have honestly never used Doña Elena's Al Dente products. But, I will now try it after learning that they offer premium quality pasta that's GMO-free plus 100% certified all-natural. It is available in five different variants: Spaghetti, Fettuccine, Lasagna, Penne Rigate and Fusilli. Their pasta are made by bronze dies for coarser texture using 100% durom wheat semolina with 13% protein (as compared to other brands which only has 6%). Dr. Philip Nino Tan-Gatue recently celebrated his 10th year of being one of the leading experts in Traditional and Chinese medicine. Having studied in China to learn all about the nitty gritty of acupuncture, Doc Phillip as he is fondly called, remains candid in answering questions thrown at him about acupuncture. He is able to relate acupuncture in a more modern manner than his contemporaries making it easier for people who have a fear of needles to understand and comprehend how it can be of benefit to them. Dr. Philip Nino Tan-Gatue studied in the Nanjing University of Traditional Chinese Medicine and gained a lot of experience in the Xuanwu Municipal Hospital and in the First Municipal Hospital of Traditional Chinese Medicine. He has also attended and gained a lot of insightful knowledge through the lectures given by Andrew Wu, L.Ac, Giovanni Maciocia, and other experts in the field. Currently, Doc Philip maintains a private practice while teaching in his alma mater and in the University of the East. He also appears frequently on radio and television to talk about Chinese Medicine and Acupuncture. He is a faculty member at the University of the Philippines College of Medicine, practicing at the Philippine General Hospital and others. He is also currently section head of Acupuncture Services at the Center for Wellness and Aesthetics at the Medical City. Happy 10th Anniversary Doc Phillip! He is also on social media. Please follow him. Traveling to the North almost every summer of my life, I have a special bond with northern culture especially their food. I can’t help but explore more and more of their exquisite cuisine. 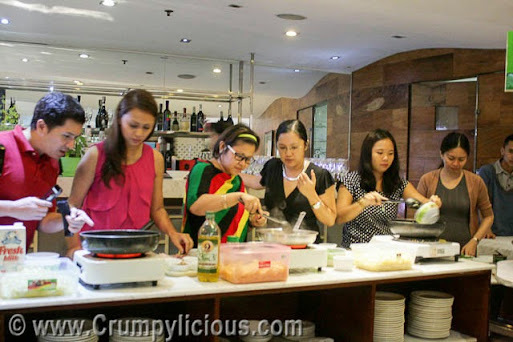 A few months ago, I just finished my 4-day food tour of Pampanga. I’ve also accomplished the same with Ilocos and Baguio. If only I had more time and money, I’d do those things more ftequently but I can’t. =( Good news has come though because MarQuee Mall in partnership with Department of Tourism, Department of Trade and Industry, Angeles Tourism Office, North Luzon Expressway, Bank of the Philippine Islands and the Lifestyle Network will hold the "MarQuee Mall’s Big Bite! The Northern Food Festival 2014" runnng on its second year. Over 100 famous merchants from the Region I, II, III and the Cordillera Administrative Region will be at MarQuee Mall on October17-19, 2014. Fortunately, I was able to join its preview. It was graced by the presence of Angeles City Mayor Ed Pamintuan and his wife who I met before when he invited me at the Pamangan Fiestang Kapampangan 2012. 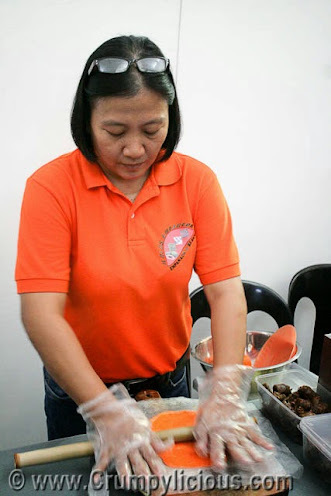 Other personalities at the event are Chef Sau del Rosario, Angeles City Vice Mayor Vicky Kabigting and Touirsm Dir. Ronnie Tiotuico. Even with a fewer spread than the actual Big Buffet Promo (MarQuee Mall shoppers can get free food samples for a minimum 1,000 php purchase from any Marquee Mall merchant), I was overwhelmed by the offerings. I couldn’t stop myself from consuming the delightful and masterfully prepared native dishes. The Pako Salad which relied on three simple components: pako fern, salted egg and tomatoes was one of the most raved dishes. 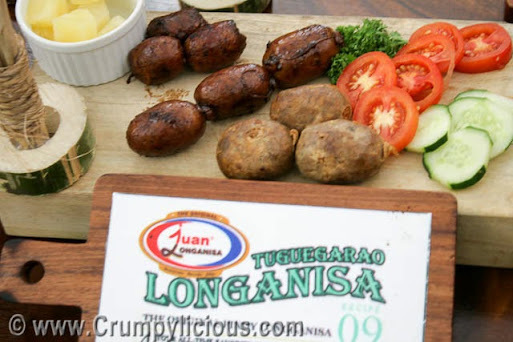 I’m not much of a longanisa fan but I can’t help but fall in love with the Tuguegarao Longanisa. And, the sisig be it Pork Sisig, Chicken Sisig or Bangus Sisig were so addictive. The Swam na Mais was mildly sweet and savory. It was also comfortably warm. The Ox-tail Kare-Kare kept me munching and licking its rich sauce skin leaving only the big bulky bones. The Fried Lumpia was overflowing with the flavor and crunchiness from the banana shoots and beans sprouts. Of course, the dish that needs no further introduction is the Bagnet. I don’t think I’ve ever tried one as good as this in my life time. My personal favorite is the Ilocos Empanada. Step 1: Grab the empanada batter abs slightly dip it into the hot oil in the deep fryer. Step 2: Place the batter on the wax paper and kneed it flat and round. Step 3: Place the shredded green papaya in a circular pattern leaving the center space enough for your whole egg. Step 4: Crack your egg and place it within the boundary of your shredded papaya. Step 6: Close your empanada press the sides to seal it. Step 7: Use a plastic plate to cut it into a half circle shape. Step 8: Gently place it on the hot deep fryer and wait till cooked before picking it up with a tong to serve with ilocos suka. We also had my favorite exotic Kapampangan dishes: Stuffed Betute, Catfish and Camaro. I’ve tried all these before but I just had to have more everytime I see them available. For dessert, we tried the Binatog (check out my first time story in Baguio) and Strawberry Taho (check out my first time story in Baguio), Cassava Cake, Palitaw, and Canonigo (crowd's favorite meringue syrupy sweet treat!). There will also be art installation by award-winning visual artist Leeroy New and the Pampanga Arts Guild on display. Lifestyle Network chefs, Chef Sandy Daza of Foodprints and Chef Sharwin Tee of Curiosity Got the Chef will have live cooking demonstrations. Stress seems inevitable when you live in the Metro. Before your work can even begin, you have to deal with the heavy traffic. After a hard day's work, you'll have to go through another rush hour traffic which can even be aggravated by sudden rains and floods. But, though life may seem a bit tiring, we do have access to great ways of rejuvenation. My secret haven for heavenly solitude and relief is Baan Khun Thai House of Thai Massage at Edsa Extension. Baan Khun Thai is open from 2 pm on weekdays and 1 pm on weekdays up to 1 am so you can drop by for some pampering even after late hours of work. They will always have a well-trained specialist ready to cater your needs without any waiting time or further delay. Upon choosing the service of your choice, you will be ushered to the foot washing area. The facilities are state of the art, new and very clean. After my foot wash, I entered their dim but artistically and sufficiently lit massage area where the beautiful ensembles and fragrant mist instantly sent me to a tranquil and relaxed mood. We passed by their foot spa area equipped with large leather couches. I never imagined the place to be so spacious given its humble facade. Each room was already prepared and ready to be occupied. I was told that they had two kinds of rooms: Swedish Massage Rooms and Thai Massage Rooms. This was the room assigned for my Thai Head, Back and Shoulder Massage (300 php). As soon as I was ready, my therapist entered the room and asked politely for my preferred pressure. As usual, I choose "hard". And, she began skillfully and artfully applying pressure to my back. It wasn't long before I found myself succumbing in her rhythmic finger pressing. I could feel heat and energy circulating all over my body as if it was light and free. The melodic sounds echoed as my mind was transported in a deep subliminal state. The pain I had on my back from long hours in front of the computer melted and wallowed away. Soon, the rest of my body was yearning for the same relief. Such desire was more than satisfied as the session ended with timely precision. I was in such a bliss that it took a while for my mind and body to register that I have to come back to reality. My therapist asked if I wanted just water or tea. As I chose tea, I was told that my tea is waiting outside. There are three choices for tea: Rice Green Tea, Ceylon Tea and Peppermint Tea. 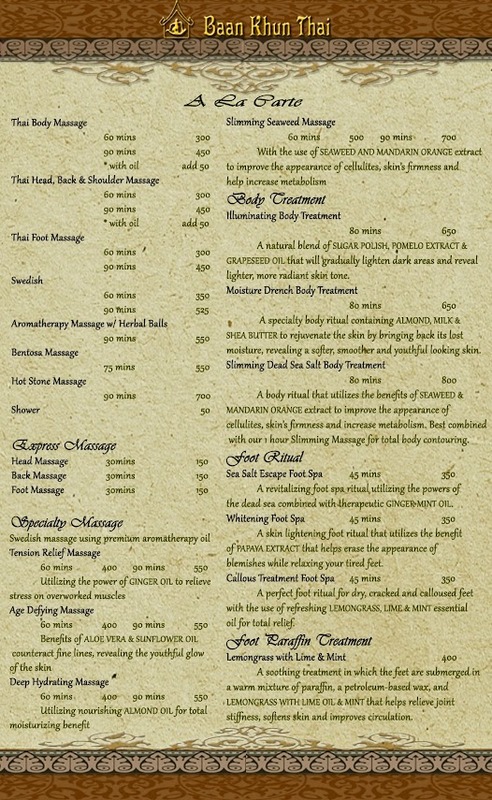 I personally found the latter quite complementary for my massage experience as it was cool and refreshing. For such a superb service and high-class facilities, their service is unbelievably affordable. They also offer a wide-array of therapeutic services: short and simple express massages, 60 or 90-minute whole body massages, specialty massages and all sorts of body treatments. 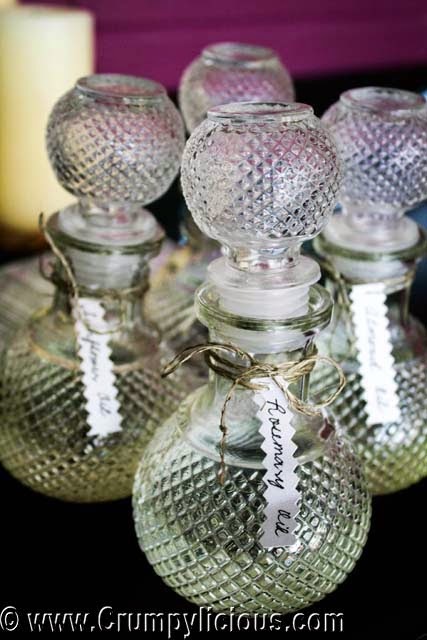 You can choose your massage oil to attain the therapeutic effect you need. They offer the Ginger Oil to relieve stress on overworked muscles, Sunflower Oil to reveal youthful flow on your skin, Almond Oil for total moisturizing benefit and Mandarin Orange Oil to improve the appearance of cellulite, skin's firmness and help increase metabolism. Packages and combinations are also offered so you can avail more savings at your preferred customizations. Baan Khun Thai House of Thai Massage is located at the 2nd Floor Phoenix Gas Station EDSA Extension (Beside Hotel 101) which is less than 5-minutes away from SM Mall of Asia (SM MOA), just a stones throw away from Blue Wave and Blue Baywalk and since is very accessible since it is connected to EDSA itself. It's also has a lot of parking spaces. No need to add stress for that right?